Even laptops seems to be outdated for this task, and that’s when dedicated HTPC boxes entered the market. 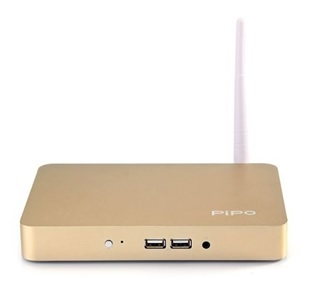 This segment is fairly new, and manufacturers are still trying to figure out the best balance between size and features; out of all the offers out there, Pipo seems to have it right with the X7S mini PC. Pipo created the X7S to be small, stylish and powerful. Despite the fact that it is not bigger than your regular set-top box, the X7S still manages to squeeze in a powerful quad-core Intel processor, 2GB of RAM and 32GB of storage, along with plenty of connectivity options. The cherry on top, though, comes from the software side, where the X7S packs in not one, but two separate operating systems: Windows 8.1 and Android 4.4. Measuring 188 by 150 by 24 millimeters, the Pipo X7S is a quite small, even when compared to other mini PCs. Its gold-color metallic case, which comes with rounded corners, gives it an exquisite look, somewhat resembling the Apple TV. On the front side, there is a power button, two USB 2.0 ports and a headphone jack. No ports are present on the sides, just some cooling vents, while on the back side, there’s a HDMI port, LAN port, power port, micro-SD card port, another set of USB ports and a Wi-Fi Antenna. 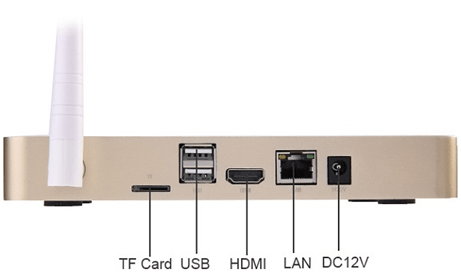 On the communications side, the Pipo X7S is decently equipped: 10/100 Mbps LAN port, Bluetooth 4.0 and Wi-Fi 802.11n connectivity, which should make it easy to connect it to pretty much any type of device or network. As mentioned before, the software side is a strong point of the Pipo X7S. 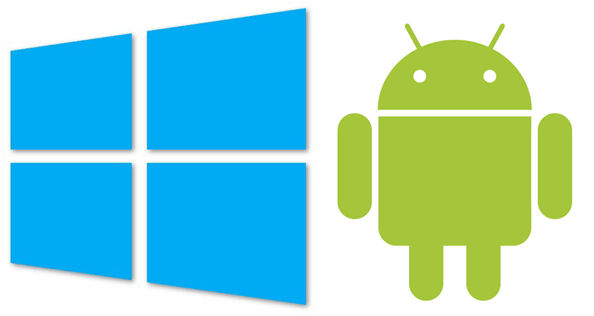 Most HTPCs come either with Windows, or Android, but none of them combine both. Pipo X7S does just that, and it does a fairly good job at it too. If you’re not happy with the pre-installed Windows 8.1 Bing edition (and there’s no reason not to be, as the installation comes surprisingly clean, with no bloatware), you can simply reboot into Android 4.4 and go on with that. The Pipo X7S has a lot of things going for it – the looks, the power, dual operating systems, and others, but that doesn’t mean it doesn’t have its downsides as well. For starters, the unit could use some USB 3.0 ports, considering that a lot of external storage units use the newer and faster standard. Speaking of faster, the LAN port could use an upgrade to gigabit speeds. Another aspect, but one that’s a two-way street this time, is the fanless design: while opting for a fanless design ensured that the X7S is dead-silent at all times, it also means that the unit might get excessively hot under heavy usage. However, Pipo seems to have opted for the silence path, presumably on the assumption that the cooling vents and the metallic body will do a decent job dispersing the heat, which is actually correct for normal usage. Overall, with a price tag of just $127.99, the Pipo X7S is a great bang for the buck if you’re looking for a dual-booting HTPC that’s small, elegant and powerful. This is the guest post by Daniel Lewis, you can check out his great website full of games – Parking Games 365!